As a person with food allergies, I dread introducing highly allergenic foods to my son. Our pediatrician said we should be introducing foods such as peanuts and eggs as soon as possible. EEK! Although I am not allergic to peanuts, I know so many people who are, and it is a scary allergy. We have an emergency plan that we discussed with the doctor; we have Benadryl ready and are supposed to take him to the hospital if he’s having a reaction that appears anaphylactic in any way. Then we are supposed to watch him for rashes, changes in behavior, and any signs of distress. The doc also said we could rub some on his leg to see if he gets any hives or rashes (we did this the day before eating it). So, we bought some peanut butter powder and finally bit the bullet. I rubbed a bit on his leg and nothing happened….that was a good start. Then, two days ago I mixed the tiniest amount you can imagine into his morning oatmeal. I, of course, made it a little too thick, so he gagged on the second mouthful! Being a bit anxious and not wanting him to associate this food with gagging, we put it aside and ate some pureed sweet potatoes instead. At least he had a microscopic exposure to the nuts. Yesterday morning, I mixed in a more reasonable amount and combined it with his pureed apples. I made sure it was NOT too thick. Low and behold, he loved it! He ate the entire serving of 2 ounces and then we had a few puffs followed by some blueberries in his mesh feeder. We played for about an hour, and then he went down for his morning nap. This morning, he had the full serving of 1/2 a tsp of peanut powder in his oatmeal and I added in some apples and green beans for a little change of flavors. I was surprised he totally loved it! I am hoping that he continues to do well and loves this food as much as all the others. 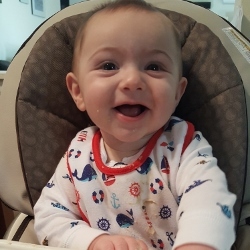 We have 1 more day of peanuts before we will officially say he is cleared to try a new food (quinoa) and then on to another highly allergenic food (dairy – yogurt!). In a small bowl, prepare your oatmeal as instructed (I mixed it with some of his formula). Get it to a slightly wetter texture than normal because you'll be adding the peanut powder to this dish. Now add in your peanut butter powder. Add more liquid (breastmilk or formula) to thin it out if it is getting too thick. It does thicken a little once sitting for a few minutes; this is especially true if you store it in the fridge! Using a new, clean spoon, add in some pureed apples and mix well.